Need to ship samples? Dry Ice Supply can not only supply high grade dry ice for next day delivery, we can also collect from you once your goods are packed and forward onto a destination within the UK or Europe. 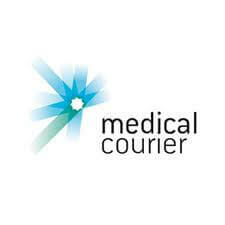 ​​We can even arrange for same day delivery *subject to location. A major use of dry ice in the medical field is as a refrigerant in transporting organs and blood. Dry ice is so much colder than regular ice and is preferred over traditional ice for medical transport as it can keep the contents colder for longer. Dry ice is -109.3 F in comparison to traditional ice which is 32 F. Another great advantage with dry ice is that it melts cleanly. Medical uses for dry ice in transportation are also used for pharmaceutical supplies. Many supplies and prescriptions are sensitive to heat and need to be refrigerated. Biological samples and vaccines can be stored and transported for long periods of time using dry ice. This can be a great refrigerant particularly when there is a lack of electricity. Dry ice is productive in storing sensitive medical supplies and samples. Our dedicated clinical trials staff are trained to understand the essential time, temperature and speed requirements that are unique to clinical trials. At Dry Ice Supply Limited , we aim to be an integral part of your trial or study by providing the knowledge and expertise required in moving your delicate samples or urgent medications from collection to delivery. To ensure safe and compliant transport of your trial, we work in partnership with your key staff and collaborators to effectively complete secure and seamless delivery. Why use our clinical trial logistics setup? If you are interested in discussing how we might be able to support your business, call 0800 085 8155 or contact us here.